Rosita EVCLO is the only authentic Norwegian cod liver oil produced from wild, sustainably caught codfish. 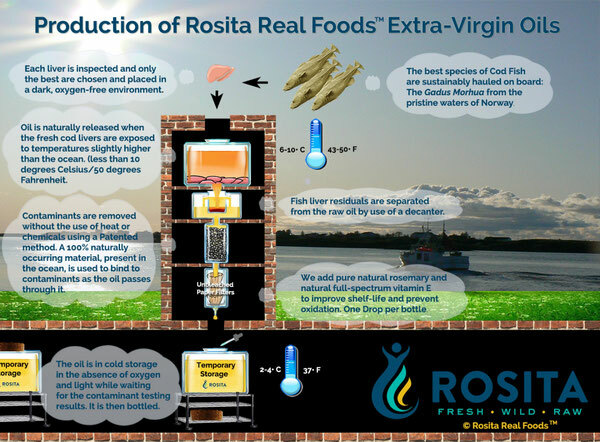 Unlike other companies, Rosita never uses imported frozen fish livers due to their questionable source, quality and freshness. 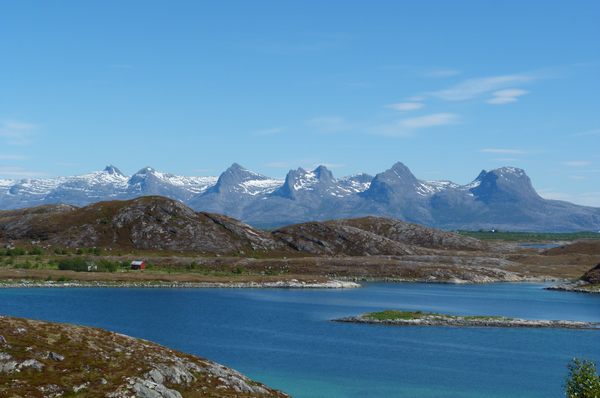 Instead, it catches its own wild codfish from the crystal clear and pristine waters of northern Norway; and uses a specific codfish species, Gadus Morhua, which has been anciently used by the Old Norse culture, including the Vikings. Following the footsteps of the ancestors and honoring the pristine nature of the Helgeland coast, Rosita adopts the traditional pole and line method to catch its fish using small open boats; not big commercial motor fishing boats. Why Choose Rosita EVCLO Over Any Other Brand?
. The oil is extracted through a very ancient and extremely rare method, during which no heat, steam, chemical treatment, solvents, mechanical devices, rendering, distillation, winterization, alkali refining, bleaching and deodorization are ever used.
. Razor-sharp ceramic blades, not reactive metals, are used to remove livers from the wild caught fish.
. To further protect the liver and oil from any potential oxidation, the production process is carried out in an oxygen-free and low-light environment.
. Rosita EVCLO is produced in small batches to ensure freshness.
. 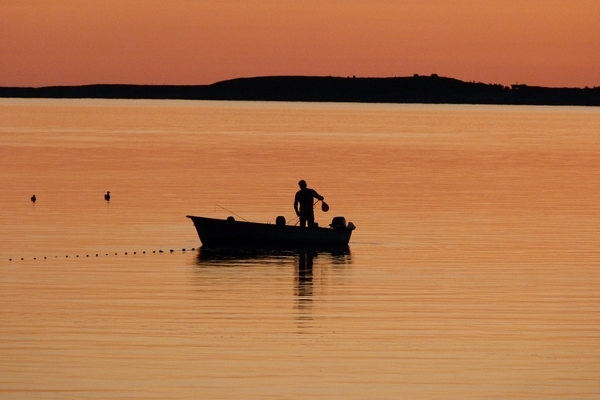 It only takes a few hours' process to obtain oil from freshly caught wild fish. Other companies store their oil in holding tanks for months, which results in a rancid oil that needs to be treated with chemicals.
. Unlike all other companies that have no choice but to use very high heat to purify their oil of contaminants, Rosita is the only company that uses a unique Patented heat free and chemical free natural cleaning method. Thanks to its knowledge of this ancient technique, Rosita uses a substance that is naturally occurring in the ocean; and has the ability to attract and bind to contaminants like a magnet.
. Such a gentle method of extraction renders an authentic, unadulterated, raw and extra virgin cod liver oil that maintains its therapeutic properties and naturally occurring nutrients, such as the fat-soluble vitamins A and D, natural sterols, antioxidants, volatile substances and minor components in their natural form and right proportions.
. Thanks to its unadulterated and unrefined status, Rosita EVCLO has the right DHA:EPA fatty acids ratio, which is either 1:1 or slightly greater in favor of DHA.
. Each batch is tested twice for contaminants and is third-party verified to be free of heavy metals such as lead, mercury and cadmium.
. Rosita only adds tiny amounts of full spectrum natural GMO-free vitamin E and rosemary extract to limit oxidation of its fresh and completely unrefined oils. 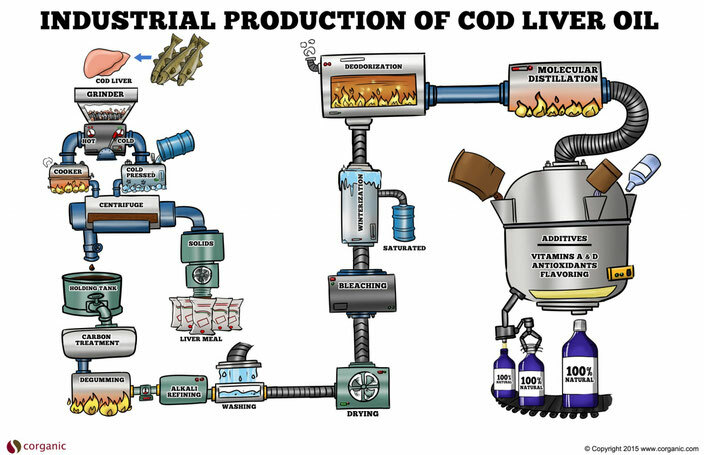 Commercial companies subject their cod liver oil to intensive refining and processing to produce a refined, bleached, deodorized and tasteless oil. The result is an adulterated product that is void of any therapeutic properties or nutritional values and has nothing to do with the true cod liver oil. The term 'cold pressed' which is used by some companies indicates the extraction of oil from the livers, however, the oil then undergoes a series of manufacturing procedures and is subjected to substantial heat.
. Alkali refining or neutralization: Oils that are harvested from fish livers are usually stored in huge holding tanks. By time, the oils' triglycerides begin to breakdown into free fatty acids, creating a rancid smell/taste. Caustic soda is used to convert these free fatty acids into insoluble soap.
. Water Washing: The oil is then washed by water to remove the soaps that were created by the alkali refining or neutralization process.
. Drying: Moisture from the water washing is removed through the drying phase. However, the oil is subjected to heat, light and reactive metals, which increases its vulnerability to rancidity.
. Bleaching: The hot oil (around 100 degrees Celsius) is treated with an acid-activated bleaching earth to bring it back to an appealing pale color.
. Winterization: During this phase, the oil is cooled down gradually to temperatures between 5-8 degrees Celsius in order to remove the saturated fatty acids.
. Deodorization: To remove taste and odor, the oil heated at a temperature between 200-260 degrees Celsius. This step damages or destroys most of the naturally occurring vitamin A and vitamin D. It may also create trans fats of EPA and DHA.
. Molecular Distillation: Molecular distillation removes the remaining pesticides and organic pollutants such as DDT. Temperatures can reach up to 200 degrees Celsius during this phase. Vitamin A and vitamin D is gravely affected by this step.
. Synthetic Vitamins: Almost all the natural vitamin A and vitamin D is destroyed during the processing and refining of cod liver oil. Manufacturers usually add synthetic vitamins to the cod liver oil at this stage to make up for the lost vitamins. However, synthetic vitamins may lead to many health problems.
. Antioxidants: Soy and GMO derived antioxidants, as well as synthetic antioxidants such as BHA, BHT and TBHQ are usually added to the processed oil to protect it from further oxidation.
. Flavorings: At this point, most manufacturers will add flavorings to cover up the fishy taste.
. Unprocessed cod liver oil is a source of natural vitamin A, vitamin D3 and Omega3 fatty acids, especially DHA and EPA.
. Vitamin D3, which acts as a hormone, impacts around 3000 genes within our body and works in synergy with vitamins A and K2. It plays an important role in bone health and can reduce the risk of cancer, type 2 diabetes, Alzheimer's disease and chronic inflammation.
. Vitamin A is essential for bone growth and night vision. Deficiency of vitamin A in developing babies is known to cause birth defects, poor tooth enamel and a weakened immune system.
. Studies suggest that low levels of Omega3 fatty acids DHA and EPA result in an increased risk of death from all causes.
. Omega3 fatty acids benefit the heart health and regulate the cholesterol triglyceride levels. Disclaimer: Please consult your physician if you are pregnant or lactating, taking medications, or have a health condition. Keep out of reach of children. *These statements have not been evaluated by the US FDA or any other food or drug administration authority. This product is not intended to diagnose, treat, cure, or prevent any disease.